You’ll need more than a cold beer to extinguish the heat from these extremely spicy peanuts! 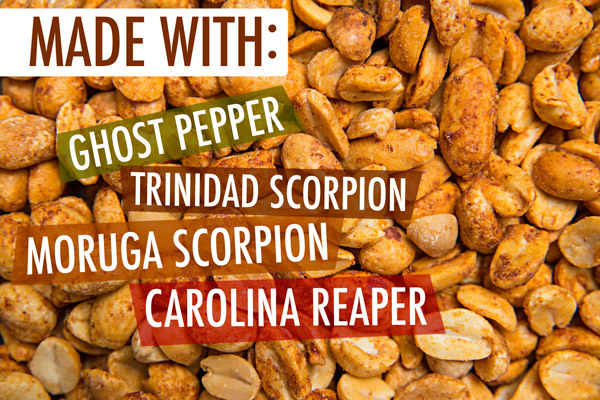 Our Hot Sriracha Peanuts are flavored with sugar, salt, garlic...oh...and, four of the hottest peppers in the world. With each mouthful, you'll taste the infamous Ghost Pepper, Trinidad Scorpion, Moruga Scorpion, and the Carolina Reaper. And boy do they bite! There are many spicy products that will leave you hurting (and of course we sell those, too!). But while Hot Sriracha Peanuts pack a powerful heat-punch, you won’t regret eating these tasty treats. 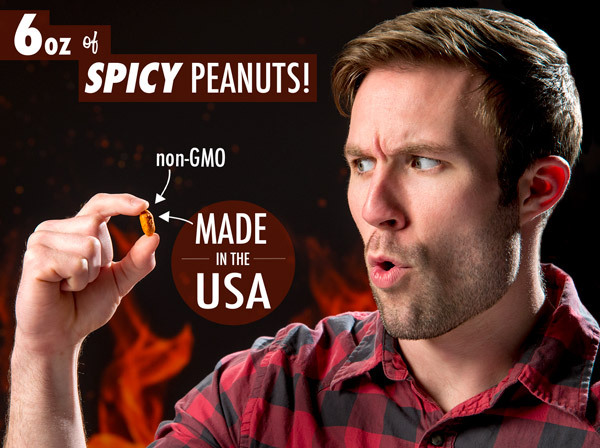 Hot Sriracha Peanuts are oddly addictive—or perhaps we just like a little bit of pain at Vat19. Either way, we strongly encourage you to throw some in a bowl for guests or keep them at your desk for a spicy snack. Just be prepared for your tongue to feel (and love!) the burn. The Flaming Hot Sriracha Peanuts get their fiery flavor from a coating of red chili pepper and a dash of some of the hottest peppers on planet Earth. The spice combo includes the famous Carolina Reaper with a Scoville scale rating of over 1.5 million! By comparison, most jalapeños have a Scoville rating below 10,000. So don’t say we didn’t warn you! Rounding out the fiery lineup are the Ghost Pepper, Trinidad Scorpion, and Moruga Scorpion—three more of the hottest peppers in the world. Each spice builds on one another to pack a peppery punch that will make your taste buds sizzle. Your taste buds have been warned. 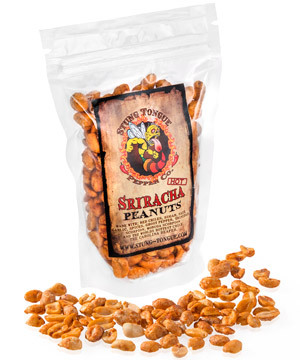 The Flaming Hot Sriracha Peanuts are more than curiously awesome; they’re curiously tasty. The sugar, salt, and garlic add non-heated flavor to your snack to keep you coming back for more of these lava-like legumes. Their unique flavor makes the peppery peanuts a fun party snack since they have enough heat to seriously burn your taste buds but not enough to ruin your night. Your guests will have fun sampling these scorching snacks and basking in the burn. Just give them a heads up before they go in for a handful. Peanuts are so hot right now. Question: How did these get so dang hot? Answer: The ingredients for the Flaming Hot Sriracha Peanuts are: peanuts, red chiles, sugar, salt, garlic, spices. Featured peppers: ghost pepper, trinidad scorpion, moruga scorpion and carolina reaper. Question: What kind of spice should I expect from these peanuts? Answer: They’re pretty hot but not unbearable. We recommend trying one peanut to begin with. Eating multiple can get overwhelming.